What a perfect classic carnival favorite? 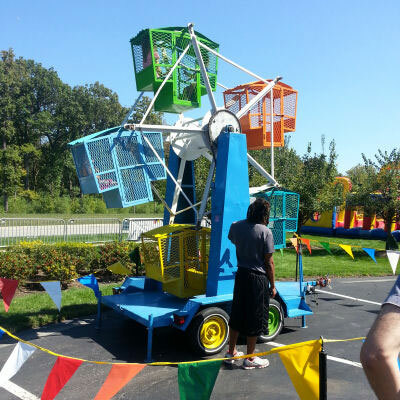 This ride is sure to keep the children at any event excited and happy. Clowning Around Celebration Authority’s Ferris Wheel has five cages that safely secure any passenger. Kids will enjoy the ups and downs of this unforgettable ride. Each cage holds two young children, up to 10 riders at a time. Guests will be amused by the passengers spinning 12 feet in the air. It will be a highlight at your next event.